Summer is Here: Time for Polo Shirts! When you’re looking for ways to allow your staff to look more professional, the Ladies & Men’s polo shirts from Sharper Uniforms are the answer. These garments convey high-end branding while offering a professional and comfortable look. Sleek and sophisticated, these shirts come in a variety of styles and sizes to accommodate anyone on your staff. In terms of ladies’ polo shirts, Sharper Uniforms has a large selection. To keep staff cool and most importantly, comfortable, the Ladies Extreme Performance Moisture Management Polo Shirt is a great option. This polo features a heat seal label, raglan sleeves, hemmed sleeves and side slits. It pairs perfectly with slacks, capris, skirts, shorts or khakis. For servers, the Ladies Server Three Snap Button Polo Shirt works well. This button-free polo shirt is snag-resistant and moisture-wicking, perfect for a long day of hard work. It features three stainless steel gripper snaps, a flat knit collar, open hem sleeves and side vents. 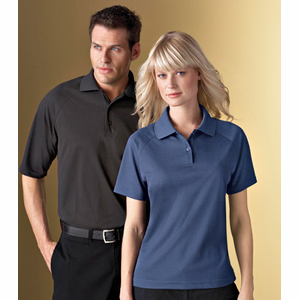 Sharper Uniforms offers an endless option of ladies’ polo shirts to accommodate your needs. In terms of men’s polo shirts for your staff, the Men’s Textured Athletic Mesh Polo Shirt is the perfect choice for hospitality staff. This garment features a three-button front placket with UV protection and a variety of sizes, up to a 5XL. Perfect for hotels, conventions, catering or resorts, this shirt has rib-knit cuffs, side slits and a flat-knit collar. For waitstaff, the Men’s Waitstaff Teflon Protected Poly Cotton Polo Shirt is an excellent choice for bartenders, waiters or other food service employees. With a medium-width collar and 3 buttons, the shirt is made of a 65/35 Poly/Cotton Blend. A DuPont™ Teflon® Fabric Protector helps to resist spills and stains with ease. Machine washable, this polo shirt offers a generous cut, making it comfortable for long hours. Whether men’s or ladies’ polo shirts or any other apparel, Sharper Uniforms offers high-quality customization services. Whether embroidery, heat seal services or screen printing, we can add anything you desire to your custom apparel order. ← Pro-Start Competition for High Schools: Sharper Uniforms donated embroidered chef coats for this local culinary competition! Copyright © 2013 by Averill's Sharper Uniforms, a division of The Sharper Knife, Inc. All rights reserved. or stock photo agencies and cannot be reprinted or sold without the written permission of the copyright holder.